Ted Brown Music carries the best in today's musical instruments -- guitars, basses, drums and percussion, amps and effects, pro audio, band and orchestra instruments, folk instruments, accessories and more. With trusted brands like Yamaha, Fender, Taylor, Audio Technica, Mapex, Hohner, Jupiter, Selmer, Bach, and many more, Ted Brown Music is dedicated to providing the most popular gear at the lowest prices. Ted Brown Music is the leading name for school band and orchestra instrument rentals in the state of Washington. 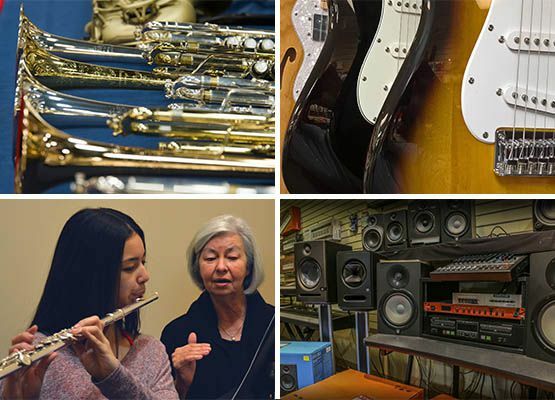 Our statewide Educational Services representatives offer free instrument pickup and delivery from school, work with students and directors, and provide complimentary services at school music events. Rent an instrument today and see why Ted Brown Music is the leader in music education. Need a tune up? Ted Brown Music has certified on-site brass, woodwind and string repair technicians in all six stores. Guitar luthiers are available at select locations. Learn more here. Learn a new instrument, or brush up on your skills. Expert private music lessons are available at your nearest Ted Brown Music locations! Choose from guitar, drums, piano, voice, strings, brass, woodwinds and more.